Gaia has conducted studies of the birds of Laguna de Apoyo Nature Reserve now several years, during this period more than 225 bird species have been documented and some very interesting trends have been noted. One important finding is that the reserve is an important host for a very special bird, the Long-tailed Manakin (Chiroxiphia linearis). This small, reclusive bird is found in the canyons, at low and middle levels of the forest, beneath the cover of canopy. The adult male Long-taile Manakin is jet-black with a baby-blue back and crimson-red head. Two long tail-covert feathers stream behind the bird. Photo Pier-Oliver Beaudrault. Although this species is uncommon in open areas, it is easily heard in its shaded habitat, with unique calls and songs that let one know where it can be found. Although the adult males are spectacular, with brilliant red head, baby blue back and bright orange legs, it can still be missed because it moves little, often remaining still for long periods, and prefers deep shade. Juveniles and females are even more difficult to sight, because the base color is olive green. Once the bird is sighted, the legs are often the diagnostic feature, because of the angle of view and limited light where the bird is perched. An immature male Long-tailed Manakin is just beginning to show blue on the back. Photo Joe Taylor. We usually think of small birds reaching sexual maturity after one year and perhaps only living two or a few years. The long-tailed Manakin is distinctly long-lived. The males, in fact, only reach sexual maturity after four years, during which their changes in plumage occur in several stages. Two or three males work together to perform a song and dance to attract the females, and the females choose the group with the most accomplished performance. The senior male of the group mates and the others await their turn to move up in the hierarchy. Females build nests and raise young alone. A male Long-tailed Manakin captured in a mist net. This is among the most commonly captured bird species in Laguna de Apoyo Nature Reserve. Photo Lukas Betthaueser. 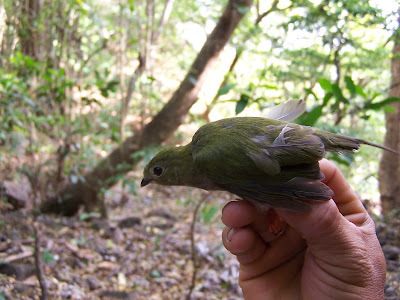 The Gaia mist netting studies of birds in Laguna de Apoyo Nature Reserve is finally yielding some useful data, after several years of capturing thousands of birds. The Long-tailed Manakin counts among the most frequently captured bird species, in the most densely forested sites, although its capture numbers are considerably lower where the forest canopy is incomplete and undergrowth is removed. We are just learning which birds are the most important species in the reserve, and definitely, the Long-tailed Manakin ranks highly. A female Long-tailed Manakin. Photo Joe Taylor. 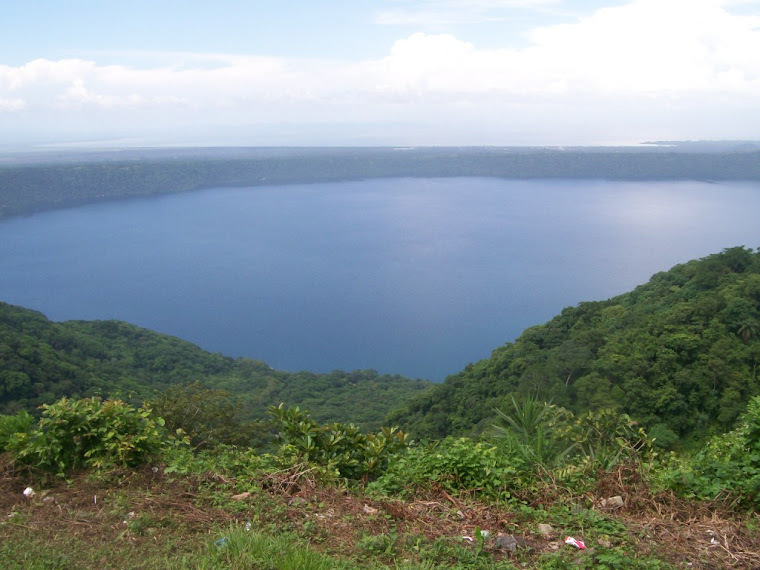 Laguna de Apoyo Nature Reserve is an interesting location to study this species, as it has a very high population density in some locations, where as many as 20 individuals have been captured in a three-day period. The high population found in our study area is also interesting because of its proximity to the southern range limit of the species, found in northwestern Costa Rica. 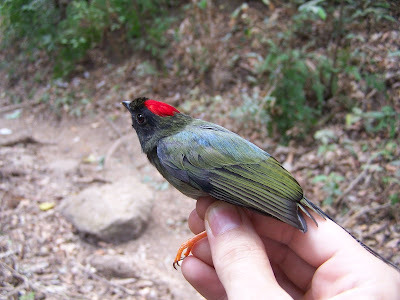 An adult male Long-tailed Manakin has lent a few minutes of his time to our scientists for study. Photo Pier-Oliver Beaudrault. In our next phase of study of this species, we hope to undertake population dynamics and nesting success. If you are interested in participating in bird studies in Laguna de Apoyo Nature Reserve, we would love to work with you. This is also a relatively easy bird to find, and we would love to take you on a birdwatching excursion. Please contact us if you would like to volunteer or undertake an internship in the study of this bird or other birds in the area or simply to go birdwatching with one of our expert guides. Two male Long-tailed Manakins in a courtship ritual. Photo Jesse Bickley and Anna James.